These crocus were the first flowers to awaken from a long winter sleep in my front yard. I wanted to get a side view angle for the photo, so I had to hold the camera on the ground to get the shot. 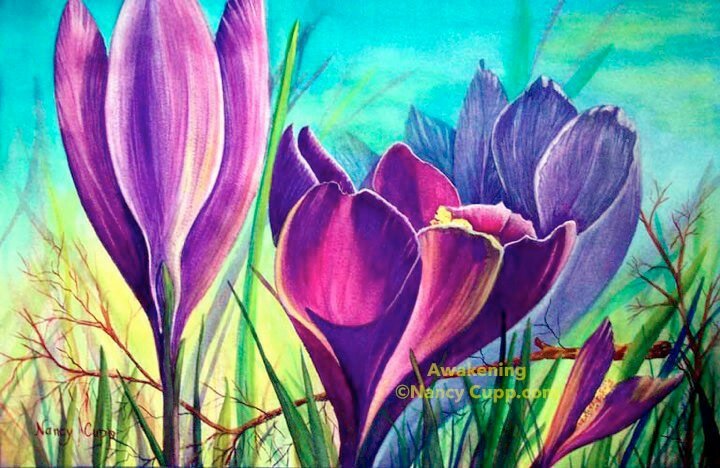 Crocus grow so close to the ground, that we usually only see them from the top, looking down. I wanted a different point of view. The crocus are still crocus, even if we look at them differently. They don’t change into something else, like an apple, just because our point of view changed. I watched an excellent movie about a year ago, that really impressed me. It was explaining the differences between the Biblical story of creation, versus today’s scientific theory of creation. The movie was called “The Genesis Code”. They came to the conclusion that both points of view were looking at the same thing from a different angle, with results that seemed to conflict with each other. Science has always assumed that time can’t be altered, but now they discovered a new body of evidence that time is not constant. Science is just now catching up to the Bible’s truth of how old the universe is. God lives outside of space and time. Humans are limited within time and space, so we have always assumed that time is constant because we are looking at time from our own viewpoint. I can’t get into the depth of it within this small space, (pun intended) so just find the movie and learn for yourself. The movie answered many questions that would satisfy both the Biblical and scientific account of creation. It is available on DVD at the library or on YouTube, where you can watch the full movie.